lt;stronggt;ALEVA256624MClt;/stronggt;lt;BR/gt;Best Valencia Series Credenza Shellslt;BR/gt;Commercial-grade worksurfaces and side panels are water-, scratch- and dent-resistant. Distinctive charcoal accent line beneath worksurface. Durable 3 mm PVC edge banding. Two wire management grommets. Full-height modesty panel. Use freestanding or combine with Return/Bridge Shell to form an amp;quot;Lamp;quot; workstation use with Desk Shell and Return/Bridge Shell to create a amp;quot;Uamp;quot; workstation. 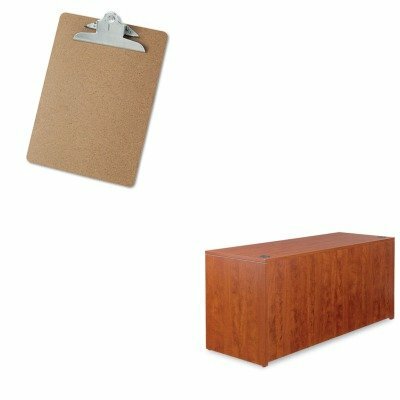 Color: Medium Cherry.lt;BR/gt;lt;BR/gt;lt;stronggt;UNV40304lt;/stronggt;lt;BR/gt;Best Valencia Series Credenza Shellslt;BR/gt;High-capacity clip lets you get a grip on large stacks of paper. Durable construction. Holds Paper Size: 8 1/2 x 11 Clipboard Actual Size: 9w x 13h Clipboard Material: Hardboard. If you have any questions about this product by Best, contact us by completing and submitting the form below. If you are looking for a specif part number, please include it with your message.